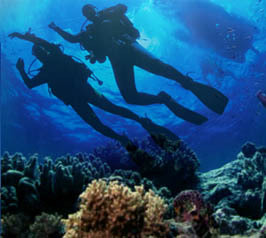 "This is a sample of our Open Water Diver - Knowledge Review. The full version include 100 questions divided in 5 modules. You can have FREE access to the full version simply by registering. It displaces a volume of water weighing less than its own weight. It displaces a volume of water weighing more than its own weight. It displaces a volume of water weighing equal than its own weight. 2. What two pieces of equipment do you use to control your buoyancy? where you are in the water? 4. When you exhale, your lung volume decreases. This mean you have ________ buoyancy. Water is denser than air, which resists pressure better. Neoprene protect the rest of my body against the pressure. Your body is warmer then water. distance ascent or descent in air because the water weighs more? A new type of fish living in the depths of Lake Ontario and discovered last year by your scuba instructor. 10. You want to equalize your ears? Every few metre/few feet before you feel discomfort. Only if they hurt enough to bother you. Once you reach the bottom of your dive.